Te Papa’s curator of terrestrial vertebrates Dr Colin Miskelly recently visited the Poor Knights Islands Nature Reserve, off the Northland coast, as part of a research team tracking the at-sea movements of Buller’s shearwaters. The project is led by Graeme Taylor of the Department of Conservation, and is intended to identify the marine environments used by these elegant seabirds, both when raising young and when on migration. Here, Colin illustrates the nine reptile species that occur on the islands. The Poor Knights Islands have a diverse, abundant and distinctive reptile fauna. It is diverse and abundant because the islands have never had introduced predators, other than pigs that were present on Aorangi Island until their eradication in 1936. It is distinctive as the islands are separated from the Northland coast by deep water, and so remained as isolated islands throughout periods of low sea-level during Pleistocene ice ages. 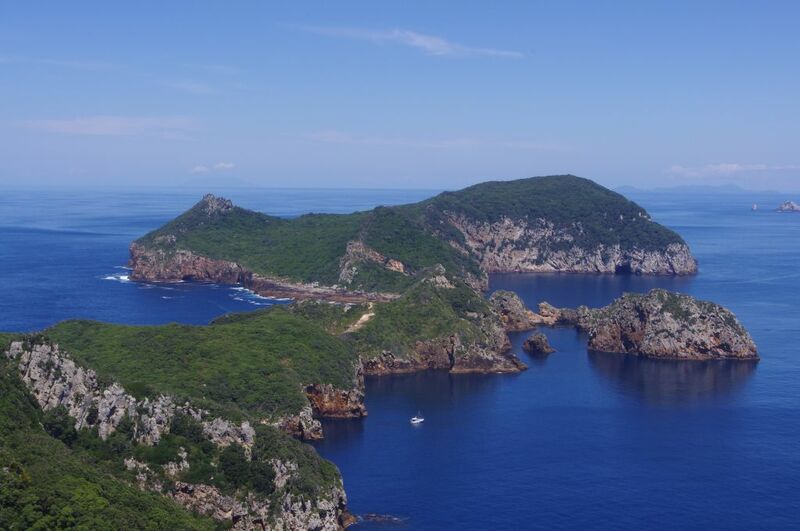 This water barrier impeded lizard movements (and hence gene flow) to the extent that three Poor Knights Islands lizard species are considered to be distinct from their relatives on the mainland and nearby islands. The top predator on the Poor Knights Islands is the tuatara, a large iguana-like reptile that is only distantly related to lizards. It lives in burrows, often in an uneasy truce with burrow-nesting seabirds. 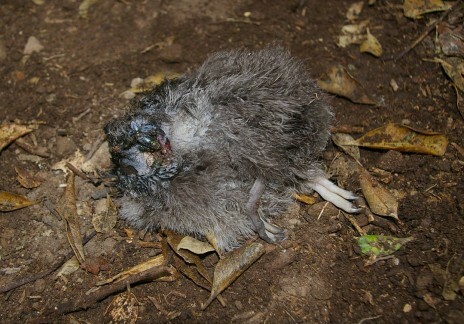 Our visit to the islands was focussed on one of the seabirds – the endemic Buller’s shearwater – and two of our study chicks were decapitated during our stay, almost certainly by tuatara. Tuatara are considered sit-and-wait predators, waiting motionless for lizards, large invertebrates, or hapless seabird chicks to venture within striking distance of their jaws. As a consequence, their diet is recognised as comprising ground fauna only. 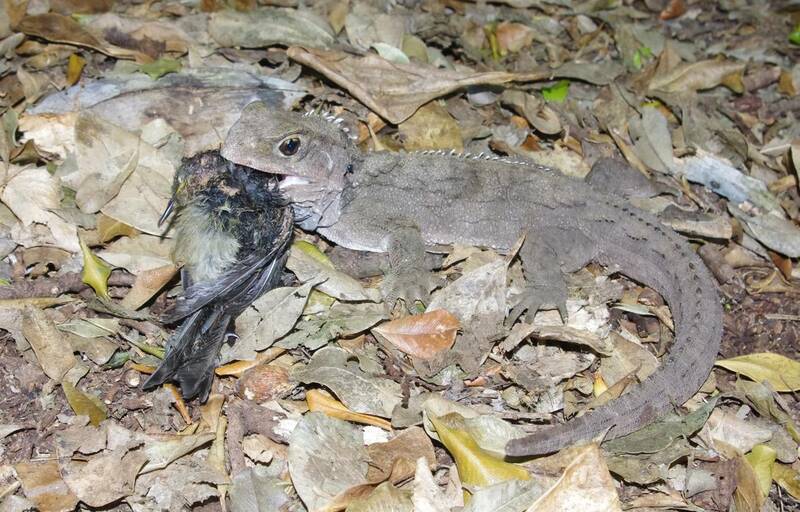 It never occurred to anyone that tuatara could catch and eat fully-flighted forest birds – but they can! Many young bellbirds were feeding on fallen karaka fruit around our camp. 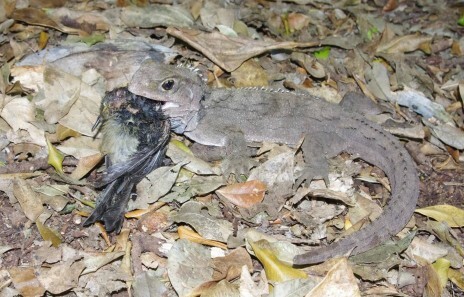 On the last day of our stay, I was alerted by alarm-calls from the bellbirds, and a commotion in the leaf litter, and was able to snap this remarkable image of a tuatara carrying a freshly killed bellbird. 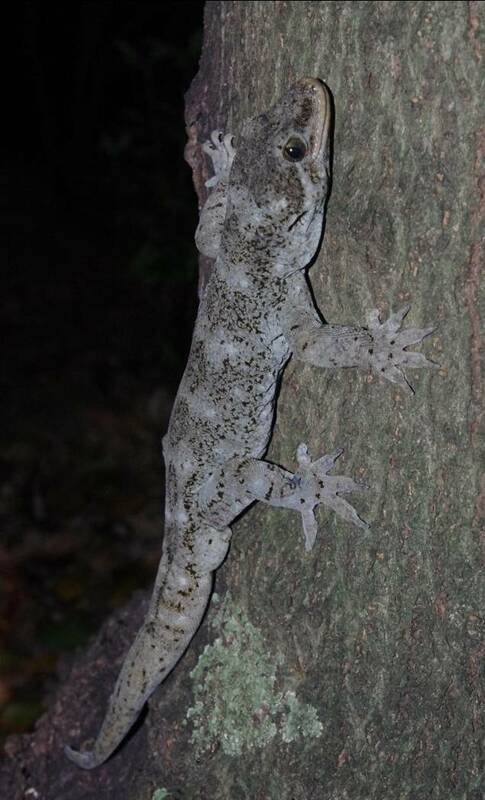 The second largest reptile on the Poor Knights Islands is Duvaucel’s gecko. Growing up to 30 cm long, these are New Zealand’s largest and heaviest lizards. Introduced predators have confined them to islands off northern New Zealand and in Cook Strait, where they emerge at night to forage on the forest floor and over rocks and tree trunks. The most abundant lizard on the Poor Knights Islands is the much smaller Poor Knights gecko. This species has yet to be given a scientific name, having only recently been recognised as distinct from the widely-distributed Pacific gecko. 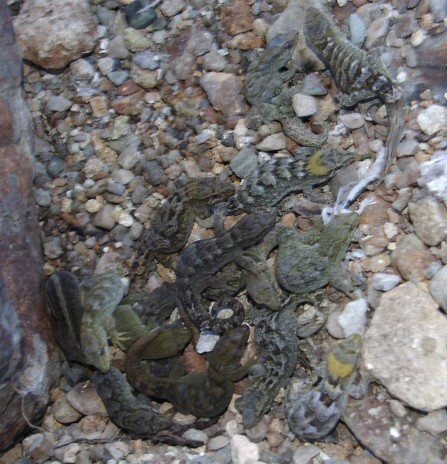 Poor Knights geckos are extraordinarily variable in their colours and markings, as shown in the following image of 15 that were clustered under a coastal rock. 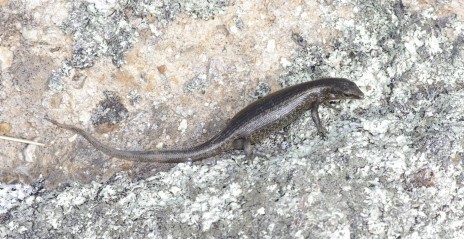 The remaining six lizard species on the Poor Knights Islands are all skinks, only two of which were abundant and easy to find. 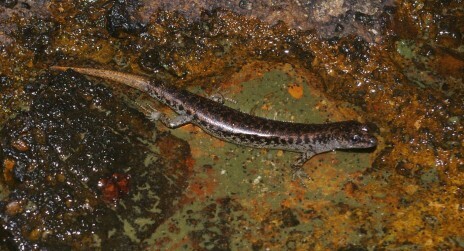 The largest skink species there is the marbled skink, which also occurs on the Mercury and Alderman Island groups east of the Coromandel Peninsula. Marbled skinks are mainly nocturnal, hiding in seabird burrows and rock crevices during the day. However, we saw a few pregnant females basking in the sun, presumably to get extra warmth to increase the growth rate of their young. The as-yet unnamed Aorangi skink is much smaller than the marbled skink. It forages at night in leaf litter in areas with smaller rocks (and therefore smaller crevices), presumably to give protection from larger lizards and tuatara that might eat it. This skink is found only on the Poor Knights Islands, and has only recently been recognised as distinct from the ornate skink, which is found throughout the North Island. 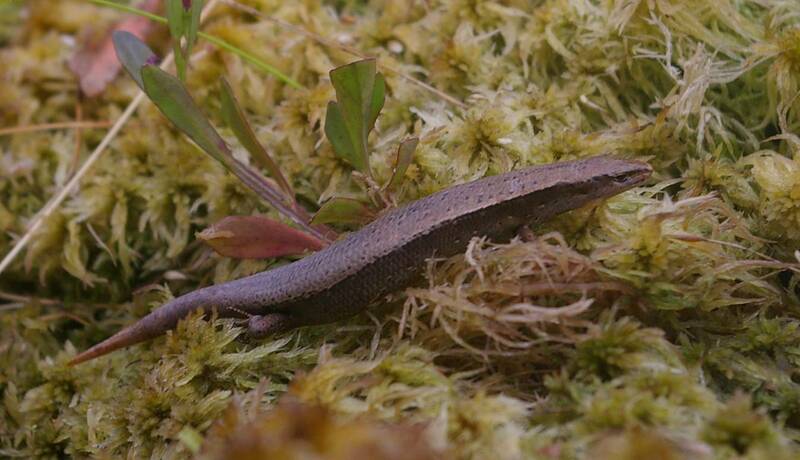 Smaller still is another endemic species – Hardy’s skink, which is one of New Zealand’s smallest lizard species. We found Hardy’s skinks living among damp coastal vegetation, but they were secretive and hard to find. 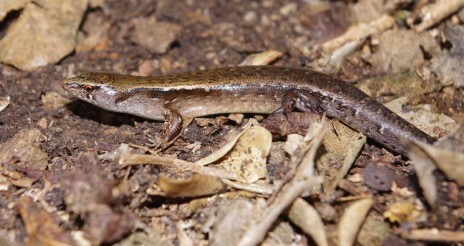 The three remaining skink species present on the Poor Knights Islands are all widely distributed on northern offshore islands. Two of these (shore skink and moko skink) were ultra-wary, hiding among dense coastal vegetation, and scuttling away at the slightest disturbance. 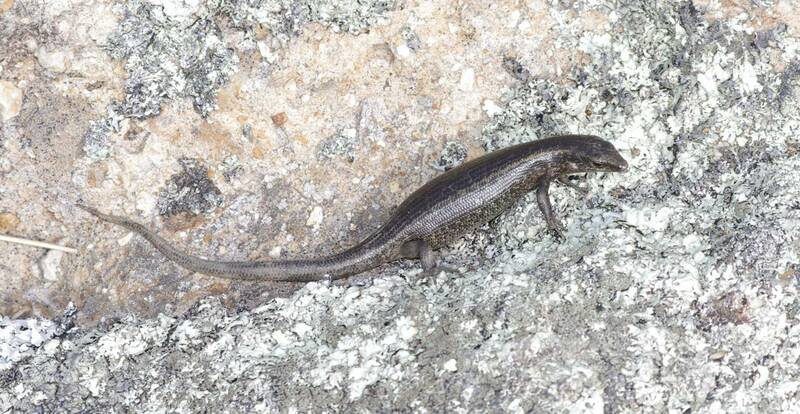 The ninth and final reptile species present on the Poor Knights Islands is Suter’s skink, which is New Zealand’s only egg-laying lizard. These sinuous skinks emerged at night to forage over coastal rocks, readily jumping into rock pools if disturbed. They are excellent swimmers, both on the water surface and along the bottom of pools. Acknowledgements: Thanks to Graeme Taylor of the Department of Conservation (DOC) for organising and leading the visit, and DOC Northland staff for logistic support. David Boyle assisted with finding some of the more elusive lizard species. Excellent stuff! Great pics Colin and very informative!